Beachy decor greats you when you walk through the door. Lots of teals and yellows throughout condo. There is a walk-in shower in master bathroom. 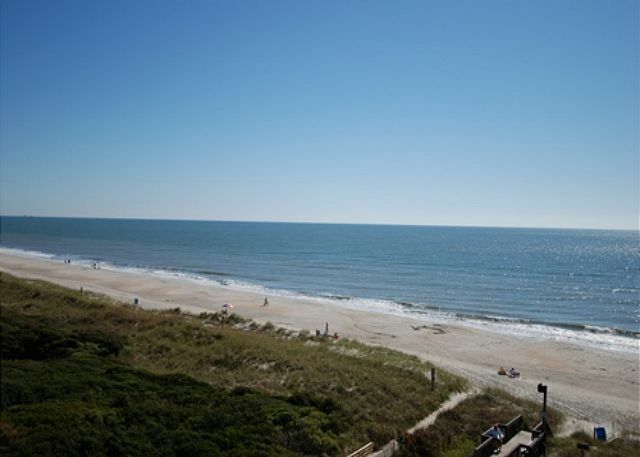 This Ocean Front condo has a great view of the beach and nature preserve. This condo does not allow pets. This condo is equipped with a King in the master, Two Twins in the guest bedroom and a Queen Sofabed in the living room. This condo has a 32" TV with a DVD player in the living room, a 22" TV in the master bedroom and a 19" TV in the guest bedroom. This condo is NOT available for monthly rentals. Rates include departure cleaning. Mandatory tax and optional linens are not included.